Last week, I threw a surprise party for my Calculus teacher (a. because we all love him, b. because he's been mad at our class for weeks and we thought it could get him to like us again, and c. because we didn't want to do work on a Friday.) Since I've already done a calculator before, I decided to go with a spin on one. He loved it! 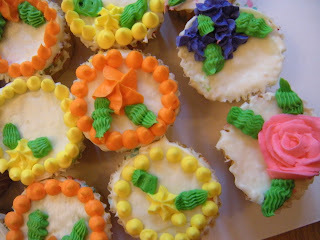 The bride, Christie, contacted me months ago to ask if I would make wedding cupcakes for her special day. She found me via Cake Wrecks! I happily agreed. I don't know why Christie and her now husband were willing to put so much trust in a seventeen year old girl, but I'm so glad they did! 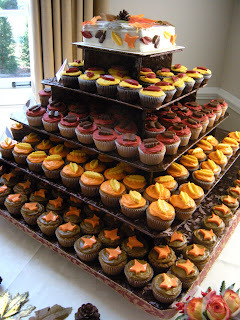 The "cake" consisted of 192 cupcakes and an 8-inch anniversary tier. 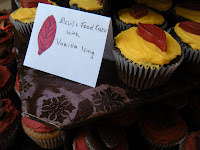 Each cupcake was made fresh and from scratch and topped with a candy leaf. 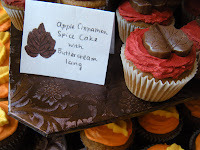 Each leaf corresponded to a different flavor cake. 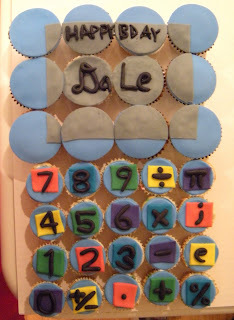 I practiced out recipes for weeks to prepare--everyone in my school has now gotten overloaded with sugar treats for my experiments. 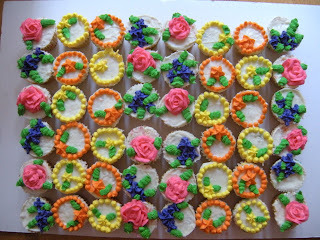 I made these mini cupcakes for a wedding shower in my neighborhood. Each flower uses a different tip. I'm new to icing roses, but they were really fun to play around with. My friend Maya recently started college at the University of Maryland. Her parents hired me to make a cake that they could bring up to her at school. 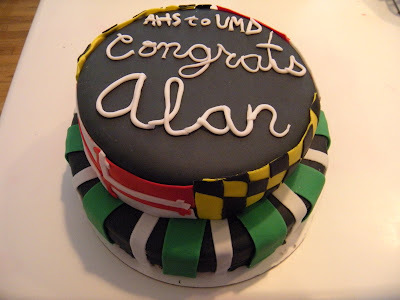 This cake is based off of the UMD logo. 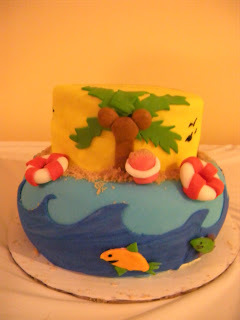 My friend Alana was celebrating her going-away to college (in California) with a beach themed party. 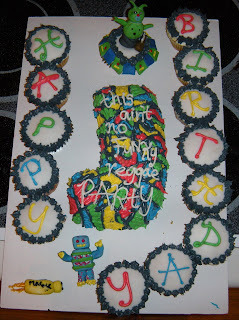 I used brown sugar for sand and fondant for all of the other decorations. 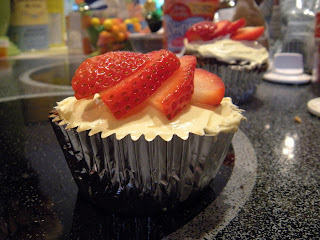 For the bottom cake, I used a new cake pan that creates a heart-shaped cavity in the middle for fillings. 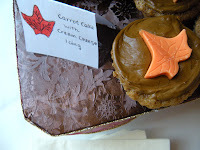 We chose to fill the cake with a caramel icing mixture. 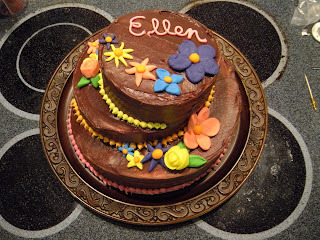 So all last year, I promised my friend Ellen I would bake her a belated birthday cake to make up for missing her birthday over the summer. Well, a full year later, and her birthday was on the day she started college. So I realized that not only did I have to make up for last year's lack of cake, I had to make one for this year's birthday as well. 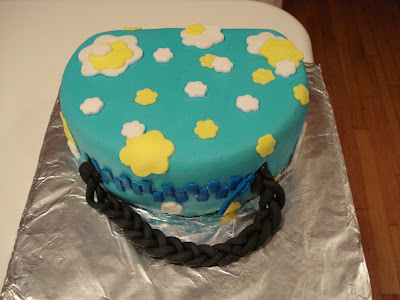 I decided no one cake would do, so I combined her love of fashion and color to make a crazy, topsy turvy cake. The cake is three tiers tall and slanted each way so that it is still level at the top. I've seen these on TV all the time, and it was fun to try making one myself! 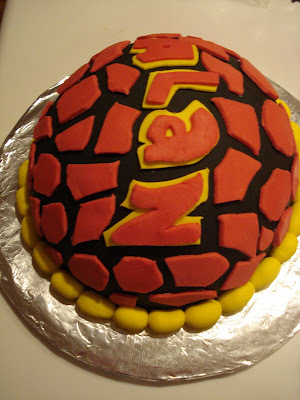 I was hired to make this cake by an Internet follower. The stick of the lacrosse is shiny because I used special silver shimmer powder on it. 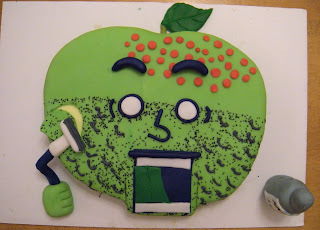 The only side effect of this was that I looked sort of like the Tin Man once I finished the cake. 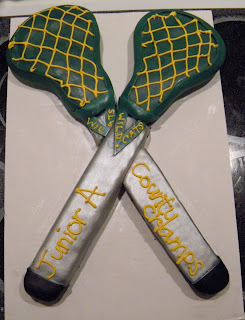 This is similar in style to my previous lacrosse cake, with a substitution of frosting instead of fondant for the strings to make it tastier as well as neater. So my friend, Chelsea, LOVES penguins. 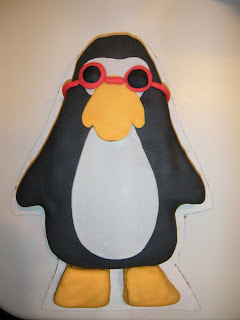 I decided to model her birthday cake after the cartoon images from the website/game Club Penguin. The pink sunglasses are an inside joke--I always keep a pair of neon pink sunglasses in my car for my passenger to wear while I drive. 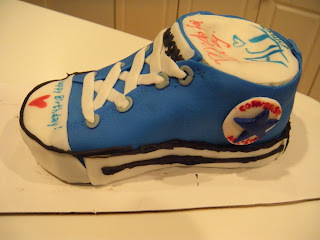 This cake was made for a friend at school, Ceci. 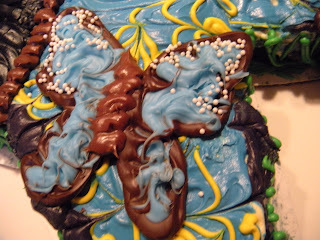 The smaller butterflies were made out of candy that I melted and molded to the butterfly wing shape. 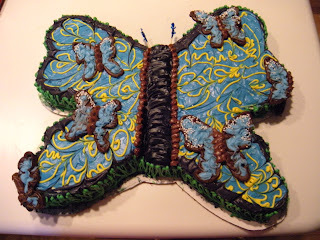 The cake itself was entirely icing. 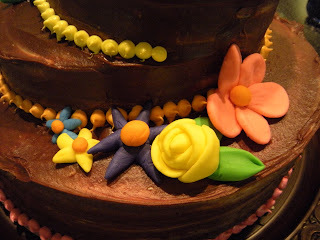 It was refreshing to try a non-fondant cake for once! 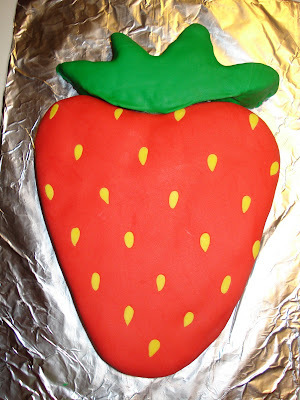 I made this cake for Cheryl, my first ever internet follower cake! She's an EMT at a fire station in Montgomery County, Maryland. 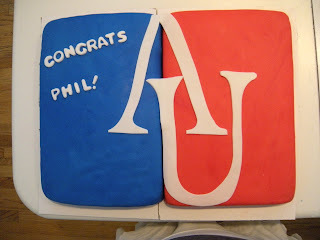 This cake was made for my friend Phil, who graduated from high school last month and is attending American University this fall. I made this cake for another graduate from my school, my friend Nicole. 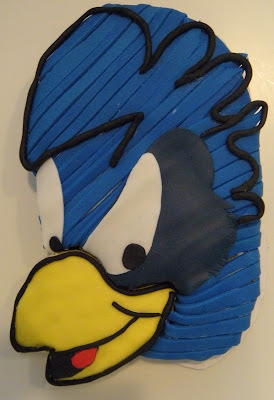 She'll be attending University of Delaware in the fall, so this cake is the fighting hen, Delaware's mascot! 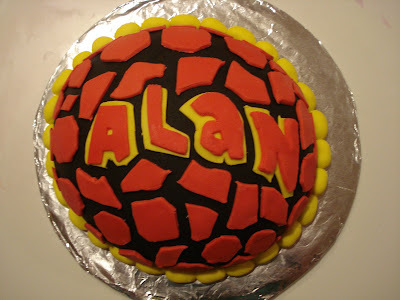 I made this cake for my best friend Alan, who recently graduated from high school. Our school colors are green, black, and white, and he will be attending the University of Maryland next year. 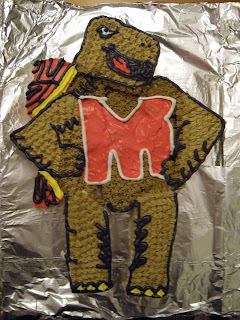 I decided that rather than making a traditional graduation-themed cake, I would personalize it by showing his transition from a Raider to a Terrapin. 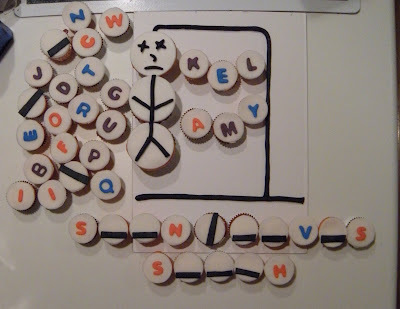 I made this cake for some of my friends after an inside joke we had about hangman. I made one of each letter so that everyone in our class could (try) to play a real game with it. 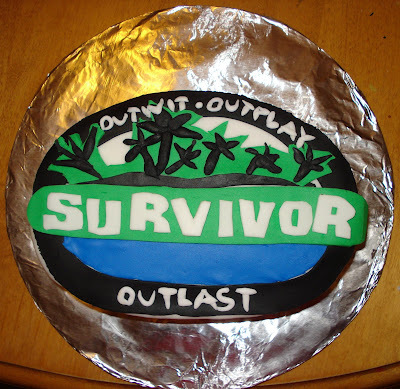 This would have worked, except people kept eating the letters! 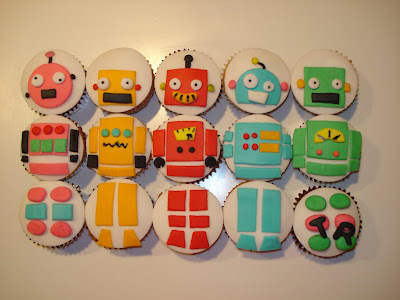 Still, I like the idea of having interactive cupcakes. 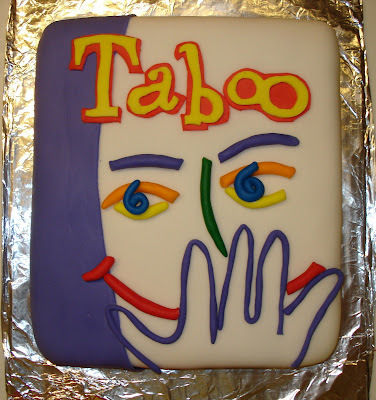 I made this cake for the last meeting of my religious education class. I came up with the expression after one of our meetings, and I thought it seemed encouraging. Although this isn't my usual style, I still wanted to feature it on the site. Sorry it's taken so long! I've been having computer troubles, but here's the latest cake! Due to popular request, I have replaced my usual foil with plain white posterboard. 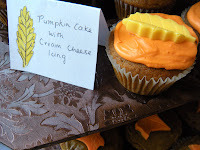 Also, I will provide more description for each cake in my posts. 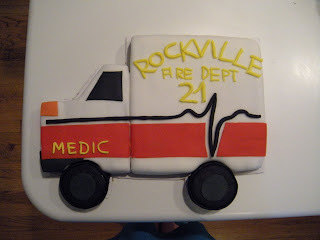 This cake was for my brother's 24th birthday. It's a big inside joke in our family that he wants to have a baby giraffe, so it seemed entirely appropriate. 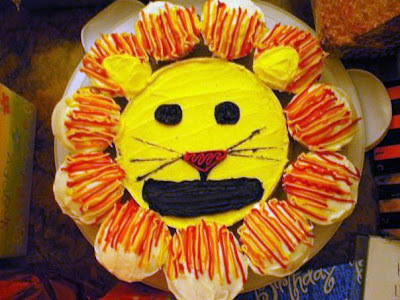 I used yellow cake with mini chocolate chips so it had a giraffe effect inside and out. Thank you to everyone who has given me support, advice, and feedback in the last few weeks! It really means so much to me! P.S. Like the new header? It was created by blogger Daisha Sheets. She's a really talented web designer. 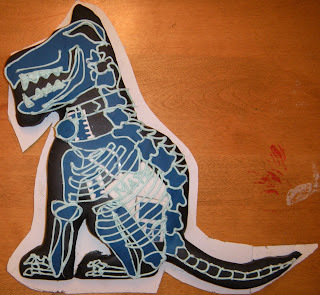 Visit her site at www.jranddaisha.blogspot.com!